Do you own a smart watch yet? What about some smart jewelry? LED-embedded clothing that communicates with your phone? Likely you don’t, and its even likelier that your mainstream family members and friends either don’t own these things or even get why they’d want to. But for the tech savvy and analysts the concept of wearables — connected devices that are embedded in clothing or accessories — is one of the hottest markets around. The challenge is building products for this segment of the market is hard because you still have to have some serious engineering chops and money to get a radio inside your product. Mbientlab wants to change this with a Kickstarter project that hits today. The engineering design firm is launching a campaign for a $30 Bluetooth module called MetaWear that is the size of a quarter and can be programmed via iOS or Android interfaces. Laura Kassovic, an engineer behind the product says that the module will be available to early backers at the end of the campaign and then a month later for everyone. That second batch of modules with be both FCC and Bluetooth certified. She said that as part of an engineering design firm, she was frustrated by having people bring projects to Mbient that they wanted to build, but then realized they couldn’t because the engineering required was too much and thus too cost-prohibitive. Kassovic’s goal with this Kickstarter is to let those hobbyists and entrepreneurs build something fast and relatively cheaply– maybe even something amazing that could make it as a real world device. These sorts of kits are important, I think, not just because they open the gates to more people building wearables, but because if Kassovic can decrease the size of the module, we could see some really compelling products on offer from larger brands. Texas Instruments(s txn), for example, has a series of connected sensor modules that you can program from your phone, but they are expensive and overkill for a simple wearable device. Getting the cost down, making it smaller and then making it easier to install and program will help drive more creativity. And this space desperately needs some creativity. Looking at the array of tech-focused smart watches out on the market is like walking into a grocery store and realizing it only sells bread. There are so many other options out there for different styles of wearables that should be connected. 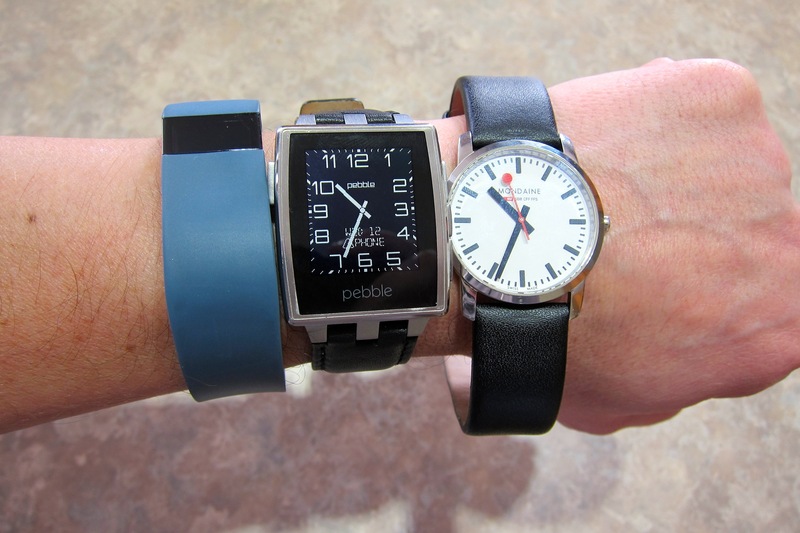 A Fitbit, Pebble Steel and Mondaine watch. As Om Malik and I discussed on a podcast a while back, wearables are not a tech product. They are a fashion product with some tech inside. Thus they need to be cheap and varied so a wide array of people can match them to their outfits. To that end I wonder if the focus on wearables from tech firms like Motorola, Google(s goog) and Intel(s intc) really makes sense. The guts may come from a tech giant, but the actual product should come from the fashion or design world. Even though the tech world is getting design religion, I can’t see it overtaking Gucci or Prada when it comes to fashion. I think Google gets this, with its recent Android Wear platform availability and its deal with Luxottica for Glass. While tech giants may have to seed the market, the real innovation will come when there are thousands of people able to pop in a radio and start playing. Then we’ll see new ideas (I want to add connectivity to my daughter’s coat buttons so she could interact with our home’s smart devices without a phone) and wearables that let us continue to treat fashion as an expression of our individual tastes as opposed to letting the tech world dictate what goes on our wrists, fingers, shoes and clothes.